-Clicking Space-bar jumps and shoots, and holding space-bar charges a higher jump and shoots a stronger bullet. -Killing enemies also changes the terrain and helps you climb higher, but can damage the player. I really like the concept of the game! It uses the Dual Purpose Design in a really cool way and the game itself is quite interesting! However, I think it lacks a bit of feel and it can be much more funny if it was faster! But overall, very good job! It's missing a bit in terms of feel. I'd like the basic jump to be a bit higher since the controls are a bit weird when you try to shoot fast. One thing I would have liked is for charged shots to penetrate targets and hit multiple ones. Otherwise, a very good execution. Nice concep and great looking game. Good job ! A really clever game! It's really challenging to avoid boxes and charge your jump at times, though, and sometimes you can trap yourself by accident, but I suppose that's part of the challenge. If the enemies didn't spawn out of thin air, it would look a lot more polished, but otherwise it's a really pretty looking game! Well done! Cool Game. I like the theme implementation but yeah, it's unfortunate that the pit feature isn't present since of the lack of sense of progress aside from the layers on boxes, which i guess works too. Good Job! This game is very fun to play and has great art and textures. The concept is also very creative and I love the arcade-like feel of the game. I think that power-ups or abilities could be added and maybe a score of either how high you get or how many boxes that you kill. Overall though this game is very well done. The mechanics in this game feel great but there's not a lot linking them. Overall though great game. This game is pretty cool. I like the idea of climbing up falling blocks to advance as it keeps the level layout dynamic. I also like the super jump mechanic as it forces you to make yourself vulnerable in order to access a movement ability whereas most games reserve charging for attack abilities. The game also has one of the better visual and audio presentations of the jam. There is no denying that his is a well put together game. While the game's core mechanic certainly fits the theme (which is more than I can say for some other entries), I feel that the pairing as it is implemented in this game is almost entirely arbitrary as the two mechanics hardly interact. The issue essentially comes down to the fact that there's never a reason to shoot but not jump or jump but not shoot, so the fact that I'm forced to do both simultaneously is inconsequential. Downwell also combines jumping and shooting, but you have limited ammo in that game, so doing one limits your ability to do the other. It also means that you can't fall and shoot at the same time, so you have to stop firing if you want to fall straight down. 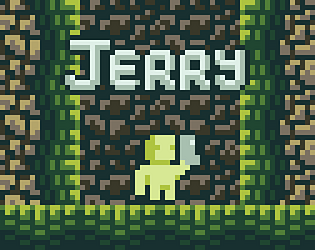 To Jerry's credit, you do have to stop shooting for a moment in order to charge up a super jump, but, other than that, they may as well be separate buttons. All this is not to say that the game is bad; on the contrary, I found it rather enjoyable, and combing the buttons does at the very least simplify the control scheme, so It's not like the mechanic is entirely pointless. I'm just saying that the game could benefit from having more tension between jumping and shooting by having one mechanic have notable consequences for the other. That aside, this is one of the more competently put together and complete feeling games of the jam. Good work! Killing the flying boxes to create a way up is a really good idea that follows the theme of the double purpose mechanic, but holding the shoot button to charge a jump is just putting two unrelated actions in the same button and, in my experience, it only made the game harder to control.